Bali is one of the most relaxing, beautiful places in the world, which makes it a perfect destination for vacations. Although some people think of Bali as a romantic or exciting couples getaway, if can be the perfect spot for families as well, especially if you choose to stay in one of the top Bali family resorts. 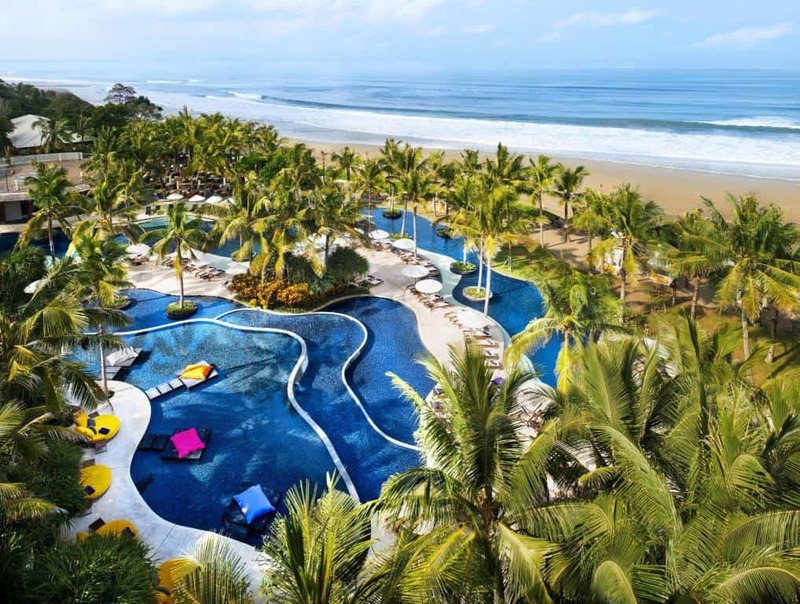 Family-friendly hotels and resorts will offer activities both onsite and offsite that will help keep everyone in the family entertained and happy for your Bali with kids trip! Bali family holidays are especially popular amongst Australian and New Zealand travelers. This guide will help you figure out what your options are when it comes to best family resorts Bali has to offer. The best hotels for kids in Bali often offer various facilities suitable for families. A lot of parents prefer to find hotels that offer swimming pools suitable for kids as well as hotels that offer a kids club and kid-friendly meals. It will help you decide which one will be the perfect fit for your family. Here is a list of 18 of the best family hotels in Bali! Banyan Tree Ungasan is one of the top Nusa Dua family hotels. This hotel is a lovely five-star resort with 80 large villas, most of which have their own pools and views of the ocean. The location makes it perfect for relaxation and includes a spa for the adults, a kids club with activities planned for children of all ages, a library with child themed nights as well as an exercise room and infinity pool for adults. There are plenty of dining options on site that cater part of their menu to children and they offer traditional dance and music performances that the whole family will love. Many of the satisfied tourists rank this resort as the best family resort Bali has to offer! The Grand Mirage is an upscale resort in the lovely Tanjung Benoa area. It caters to families with a large selection of daily activities for parents and children. Including free non-motorized water sports, an excellent spa that also provides treatments for kids, which would make for a perfect mommy-and-me day. All the rooms are very large and have flat-screen TVs, free Wi-Fi, and free minibars which are refilled every single day. It is a great option for your Nusa Dua family accommodation. Hilton Bali Resort is a family-friendly property with a scenic cliff-top location. Among the special features here is a private beach with water activities for adults and teenagers, tennis courts that can be used by all ages, a full-service spa, a fantastic kids' club, several restaurants which all have children's menus, and a huge swimming pool with a special kids section. The rooms are all large and family friendly with deep-soaking tubs, as well as balconies. Choose to stay in a villa for an especially special experience complete with butler service and access to an exclusive villa lounge with numerous perks, including childcare. The Hilton is one of the best family hotels Bali has on offer and ranks as the best kids friendly hotel Bali has to offer in this price bracket. The Courtyard by Marriott Bali Nusa Dua is a fairly new resort. It has things that everyone in the family will enjoy. The restaurants all have child-friendly menus and everyone in the family will enjoy the lagoon swimming pool which features a slide for children and a swim-up bar for the adults. The rooms are all very spacious and include minibars, flat-screen TVs, and balconies or terraces. There's a prominent family-friendly vibe. They have a kids' club and kids' pool, which have special activities and contests every day. 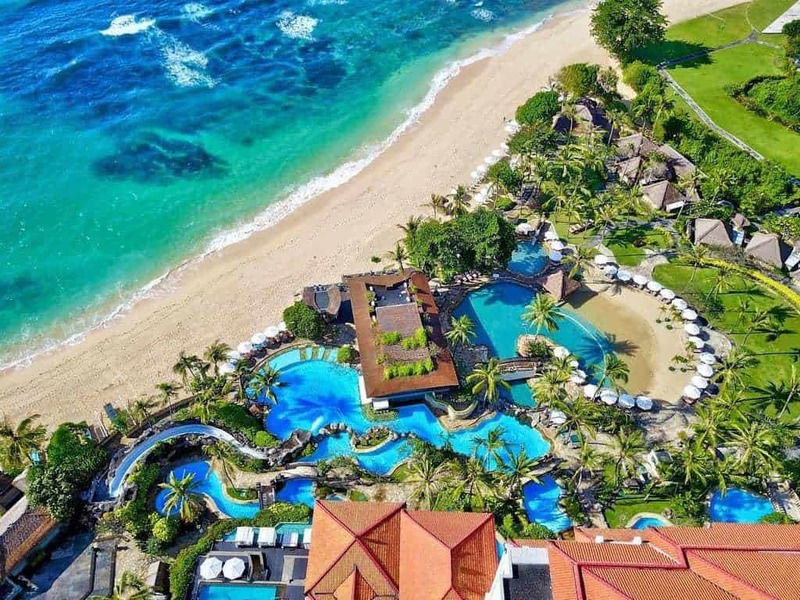 The Nusa Dua Beach Hotel & Spa might not sound like a family friendly location because it includes a spa (and people don’t usually think kid-friendly when they hear the word spa), but you would be wrong. Its rooms are large, sunny and family friendly, with plenty of traditional decorations from local crafters. We have included it on our list of best Bali hotels for kids, but maybe we should have includes it as a hotel perfect for adults as it is a great choice from the Bali hotels with a kids club on offer. So you can book your kids in and actually go and enjoy that spa! One of the best adult perks to staying at the Nusa Dua Beach Hotel & Spa is the free access to the spa, outdoor pool, steam room, and sauna. The onsite kids club, which has daily kids activities, video games and interactive nature classes guarantee that your children won’t be bored while you enjoy pampering yourself with a nice massage at the spa. They also provide free scuba diving lessons, which can be great for the whole family to enjoy together. They have a few different restaurants on site which all offer kid-friendly meals. 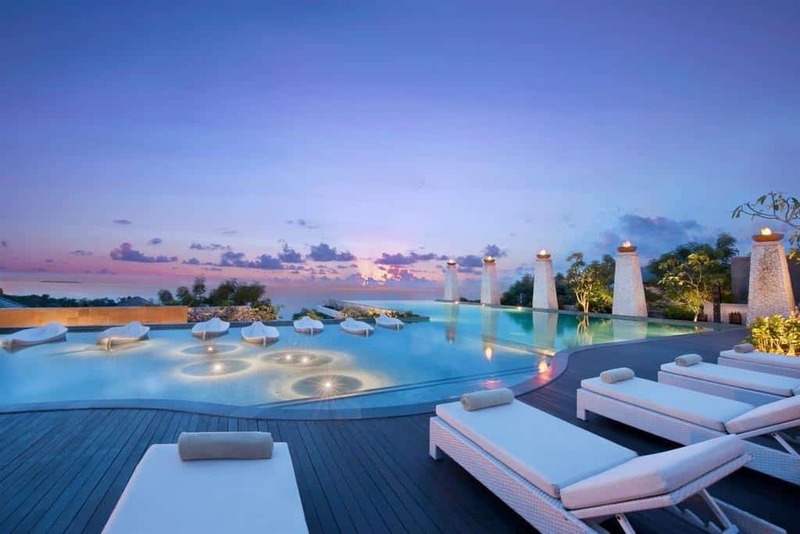 The Grand Hyatt Bali is a fantastic family getaway for any family that is visiting Bali. The hotel is luxurious and very large, with almost 700 rooms on about 40 acres of land, including its own personal lagoon and its own personal beach with the white sand that Bali is known for. This is a perfect place for children because they really try to cater to families. They have a river pool, which has two water slides (for children or adults). They also have sandcastle building classes and exhibits. The kids club is for children up to the age of 12 and has a large playground and arts and crafts center and various games. The Grand Hyatt Bali also makes sure to provide activities that the family can do together. You can take Balinese dancing class together, go feed some fish or start a game of beach soccer. They also offer babysitting at any time, so adults can go enjoy the spa, tennis courts or one of the four bars. There are five restaurants on the property, all of which offer a children's menu. 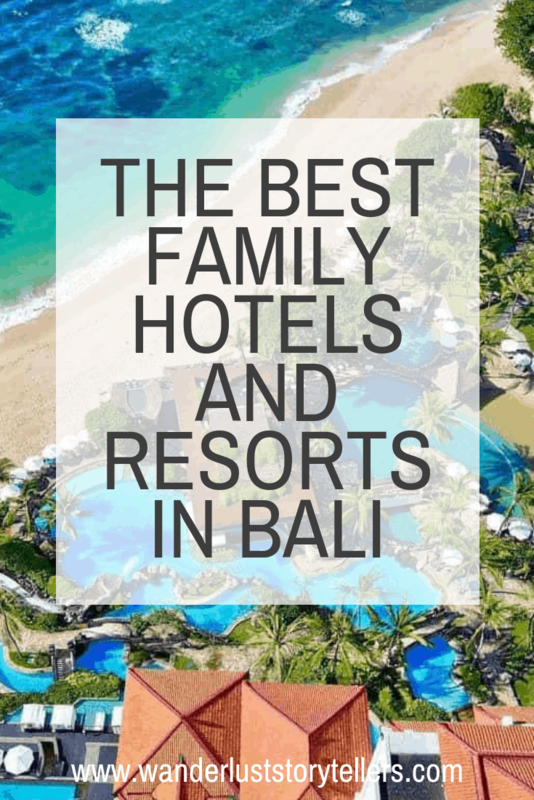 This resort deserves to be on every list of best resorts in Bali for families! 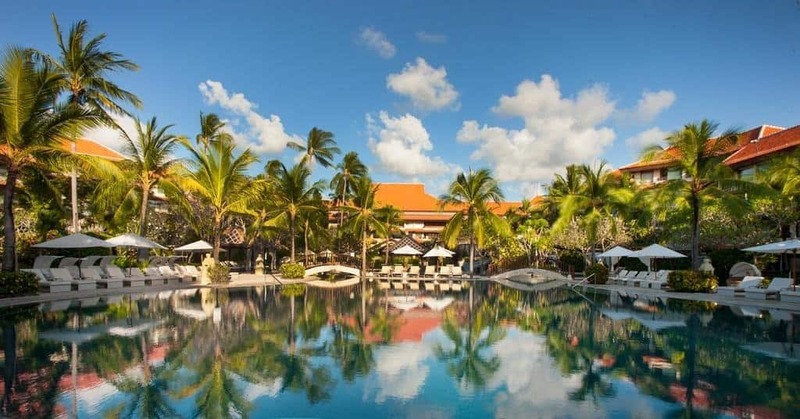 The Westin Nusa Dua Resort is a lovely seafront resort in central Nusa Dua, across the street from the Bali Convention Center where many family friend events are held. When staying at The Westin Resort Nusa Dua you will have direct access to the beach, a kids club and special area for teens which make this a very popular choice for families. All of the rooms come with modern amenities, some of which have a beautiful view of the tropical gardens that surround the saltwater swimming pool. There are many restaurants on the property, most of which serve kid-friendly meals. 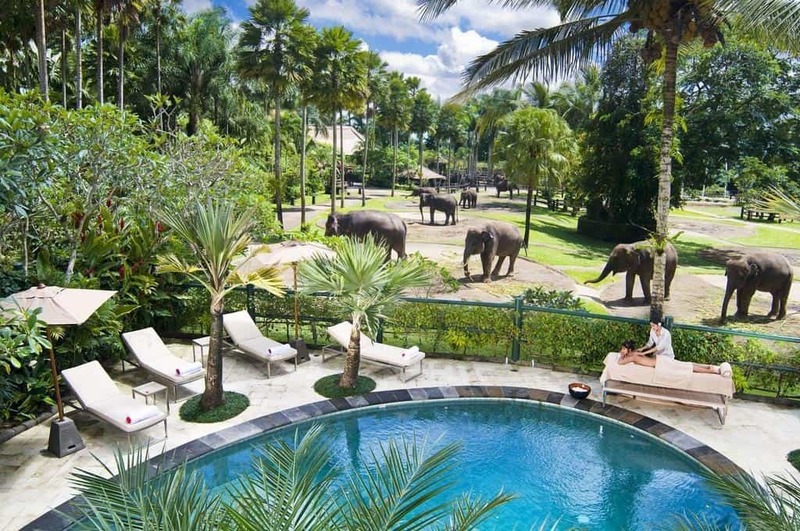 Padma Resort Legian sits on 16 acres of beautiful tropical gardens. They have 409 large rooms with multiple kid clubs and three swimming pools. They also have six restaurants, most of which have kid-friendly menus and for the parents, they offer a full spa, sauna, steam room fitness center and a basketball court. 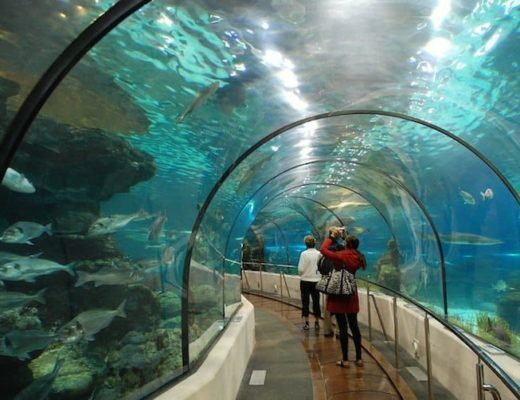 They have daily kid-friendly activities which include feeding fish and contests. They also have a family pool with two water slides that can be enjoyed by children and adults alike. The Padma happens to be the best place to stay in Bali with family due to its kid-focused aspects. Belmond Jimbaran Puri Bali Resort has got it all. There are 7 types of accommodation choices here, including beach view suites, garden view cottages and a selection of amazing villas, such as a one and two-bedroom luxurious pool villas. Sounds great? Because it is! There plenty of great activities on offer here as well, including dancing and cooking classes as well as local market tours. Alternatively, you can relax by the amazing infinity pool whilst gazing over to the beautiful beach. This is a great resort for families and couples alike and ranks as the best Bali resort for families in its' category. We love staying in this area of Bali. Wondering what there is to do here? Find our guide about what to see in South Bali. 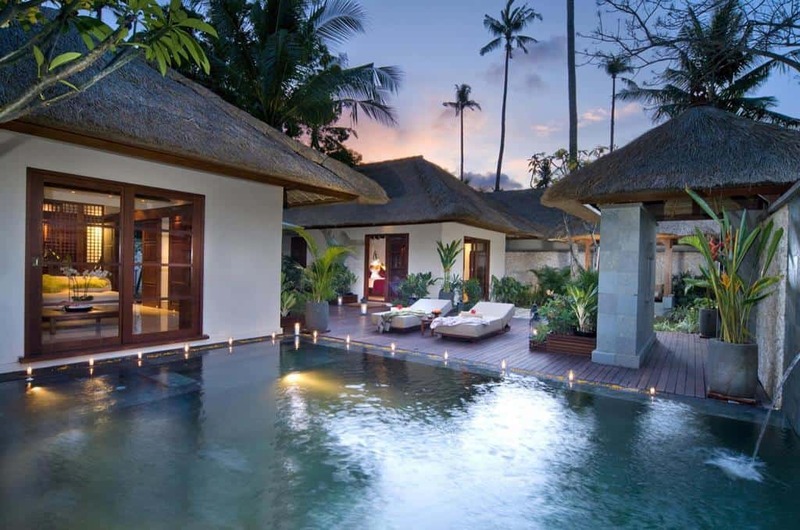 Click here to see latest prices for Belmond Jimbaran Puri Bali Resort. You will find everything you want in a family vacation at Le Meridien Bali Jimbaran. This five-star hotel has 119 rooms, which all include a balcony and access to the hotel’s most famous attraction, the huge saltwater lagoon swimming pool. The hotel also has a fitness center, spa and many restaurants with menus that cater to children as well as adults. This is perfect for a family because of the kids’ club, which has activities planned for every day of the week, as well as family packages which include activities and food for children. This not only a really cool place for the family holiday but it also ranks as one of the best hotels in Bali for families. With a pool like the one at W Bali, every kid will be in 7th heaven. If you are after one of the top hotels in Seminyak Bali, look no further! This resort is one of the best family resorts in Bali. It offers relaxed surroundings and its beach is lovely and clean and free of vendors! Yay! Now if the pool wasn't enough, maybe the free treats, a juice and water at the lobby for the kids will convince you that this is the best family hotel in Bali!? They have many kinds of rooms, including spacious villas. You can choose between one and two bedroom Bali family villas. These gorgeous villas have their own private pool as well as balconies that either face towards the garden or the ocean. If you are wondering where to stay in Bali with kids that offer a truly memorable experience then this is the one for you. The Elephant Safari Park & Lodge is a huge property that gives everyone in the family a unique vacation experience. 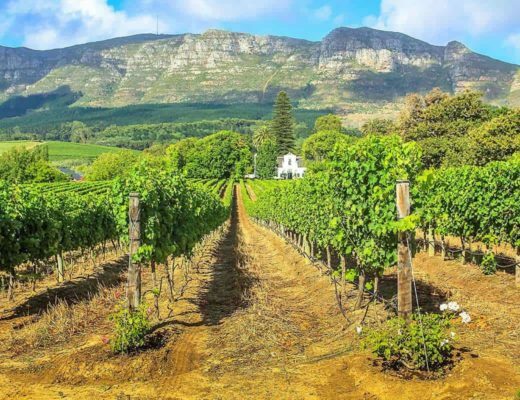 With 31 elephants on the property as well as safari rides as elephant chauffeur service, a show arena, a museum, a gift shop, and a botanical garden, everyone in the family will have a memorable time. For the adults, there is also a gym and spa, along with childcare. Each room comes with all the modern amenities, as well as unique features such as an elephant pick up platform. The more expensive rooms have spa type bathrooms and offer butler services. They also provide a safari experience which is guaranteed to bring a smile to any child's face. A great option for your Ubud family accommodation. Opened just a few years ago, the Kana Kuta hotel has budget-friendly prices and is located very close to local area attractions and the airport, which makes travelling with children much more convenient. They have an outdoor pool available for use by the whole family, a free area shuttle, and free breakfast. Rooms are fairly well sized and all include free Wi-Fi. The kids center is what makes this place absolutely perfect for families. They have activities every day for children and adults and provide childcare for an extra fee. With the cheap prices and beautiful area, it is a great deal. Many satisfied reviewers rank this hotel as the best family hotel Bali has to offer in the budget bracket! 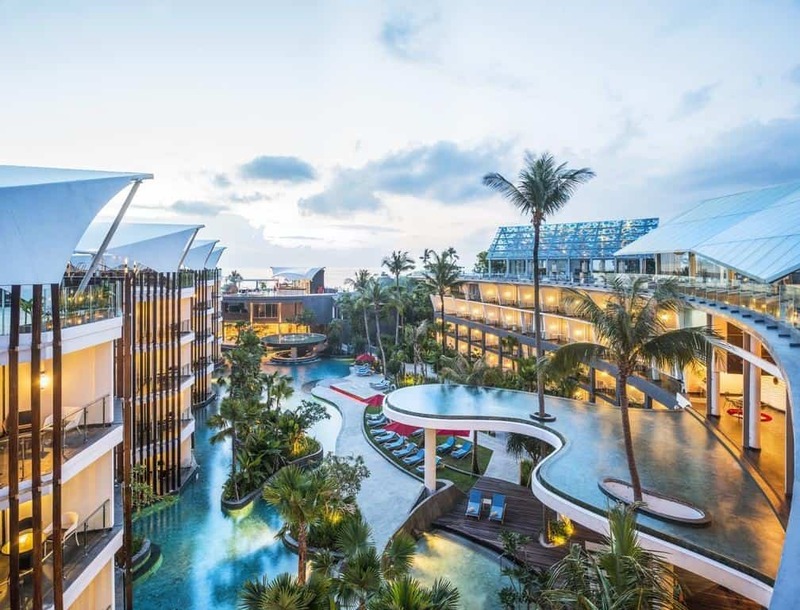 This upper-middle-range, 400 room hotel is located right on Kuta Beach next to the Discovery Shopping Mall, which has some great attractions for the kids. Rooms and Villas vary, but all are large enough for families and some even have access to private pools. Garden View Rooms can get noisy as there's a nightclub next door, so make sure to avoid one of those rooms if you are traveling with your kids. Special amenities include a large pool with a swim-up bar for the adults, a spa and a salon, a large children's playground, a gym, dedicated kids pool, three restaurants that are all child-friendly and a giant kids club. They even have a life-size chessboard that adults and children are sure to enjoy. The cozy Green Garden Hotel is an older, affordable hotel offering lovely rooms close to the beach and the local airport. The property is a little bit older and has a bit of a retro feel to it, but that just adds to its charm. The real gem of this hotel is the family rooms. The family rooms have bunk beds, games and activities as well as free non-motorized water sports accessories. The restaurant is popular with visitors and locals and provides many child-friendly options. They also have a pool just for children and provide babysitting for an additional fee. The Green Garden Hotel is one of the cheaper of the family-friendly resorts Bali has on offer. Located in the lovely waterfront of Tanjung Benoa beach, Holiday Inn Resort is the perfect place for some family fun. Holiday Inn Resort has four pools, with a kids pool centered in the middle of the main pool so it is easy for children to play and the parents to keep an eye on them. The children's pool has water slides, huge tipping water buckets and fountains for the children to play in. They also have a kids club with a giant ball pit, a rock wall, and costumes in the style of local traditional clothing for the children to play in. For older kids, and young at heart adults, you will want to go to the game zone which has darts, pool, and video games. All of the rooms at the Holiday Inn are large and family friendly. We personally love Holiday Inn resorts as they typically offer great Bali family-friendly resorts holiday packages. White sandy beaches and the views of the Indian Ocean will welcome you as you start your vacation at The Ritz-Carlton, Bali. Every single room is made to accommodate up to 6 people, which means most families will have plenty of room. The best thing about staying at the Ritz-Carlton is that they offer full planned itineraries for the whole family. You can relax in one of their many pools and then spend the night watching a movie outside under the stars. They also have a special area called Ritz Kids. They have activities that children of all ages will enjoy including games, costumes, and dances for the older children. During the day adults can go enjoy some time at the spa while the kids get to pretend to be mermaids all day in the aquatic goddess center which lets them dress up as mermaids and play in shallow pools. A great family activity that everyone can enjoy is the sea turtle preservation programme, which will allow you to get up close and personal with baby sea turtles. Also, make sure you don’t miss out on the kite runner programme which allows families to craft and then fly their own kites! If you are looking for a fun family vacation, then the Hard Rock Hotel Bali is perfect for you. They offer two specialty suites for families, the Roxity Family Suite, and the Luxury Kids Suit are apartment type rooms which can fit a family of four very comfortably. Each room has a living room area, a dining area, day beds and special deluxe bedrooms with personal bathrooms that include spa tubs for the parents. The children's rooms are very colorful with bunk beds and decor that every single child will love. All of the family rooms also include large TVs, video games and even a special children's bathroom. There are multiple pools, one of which is only for children. They have a special kids club where you can leave your children with babysitters while they play games, dance and learn about the local culture while you and your spouse enjoy some alone time at the spa. The Fairmont Sanur Beach Resort will delight children as much as it will parents. It is one of the best Sanur family hotels. They offer specific packages just for families that make sure to cater to everyone, regardless of age. The kids club is filled with activities and events for children of all ages every day of the week, most of these activities include free child care as well. These activities take place between 10:00 am and 7:00 pm , which gives you plenty of time to have fun with your spouse. One of the best things about the kids club is the focus on fun and education. They have traditional lantern making classes, yoga, Indonesia lessons, and even leaf printing. All meals are free for kids at the resort's popular grill, which is also right next to the child's pool, so parents can enjoy a meal and a drink while still being able to keep an eye on the kids and enjoy watching them have fun. All rooms at the Fairmont Sanur Beach Resort are family friendly and come with plenty of amenities to guarantee that you enjoy your time in your room or out of it. Did you find a hotel for your family trip to Bali? 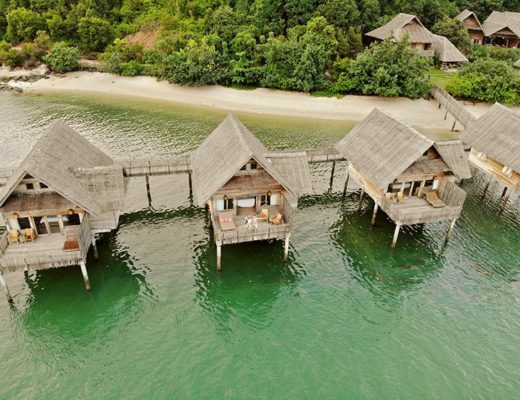 Which hotel do you think is the best kids resort Bali has on offer? Who does not know Bali? Almost all people around the world know Bali and chose Bali holidays, thank you for giving your tips and information about Nusa Dua.